This microcar was built in Germany as a "Schottenring" car. Originally there was a steel bumper around the car and they rode on a wooden track (RING) in an Amusement Park. Two versions of this car were built, the only difference being the front nose section which was interchangeable to create different "models" with minimum effort. The car was built by Frank and Thomas IHLE, brothers who worked out of Bruchsal Germany. Prior to building Amusement park rides like this one and the "Wild Mouse", they had manufactured racing cars including a racing version of the BMW Dixie and are generally credited with creating the signature "double kidney" grille for BMW. ("the brothers with the name IHLE") to produce cars for amusement parks and fairs. IHLE is commonly misspelled as "JHLE" due to the script lettering. 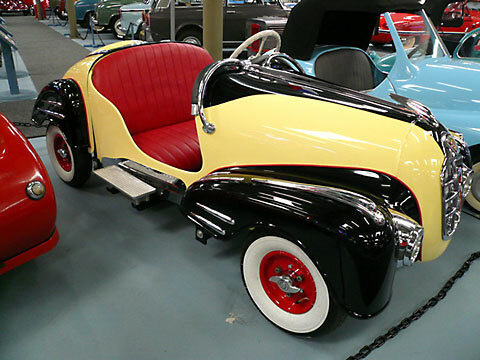 Although not originally designed for Road Use, this miniature car has more power and is built sturdier than many Microcars that were offered to the public for daily use. Proper road use of this vehicle was probably prevented by the method of starting which required it to be push started by an employee of the Amusement Park. Weight: 600lbs Electrics: 12v 4 Wheels: 4.00 x 8"